Not to be confused with Channel. For other uses, see Chanel (disambiguation). Chanel S.A. (/ʃəˈnɛl/, French pronunciation: [ʃanɛl]) is a French privately held company owned by Alain Wertheimer and Gérard Wertheimer, grandsons of Pierre Wertheimer, who was an early business partner of the couturière Coco Chanel. Chanel S.A. is a high fashion house that specializes in haute couture and ready-to-wear clothes, luxury goods, and fashion accessories. In her youth, Gabrielle Chanel gained the nickname Coco from her time as a chanteuse. As a fashion designer, Coco Chanel catered to women's taste for elegance in dress, with blouses and suits, trousers and dresses, and jewellery (gemstone and bijouterie) of simple design, that replaced the opulent, over-designed, and constrictive clothes and accessories of 19th-century fashion. The Chanel product brands have been personified by fashion models and actresses, including Inès de La Fressange, Catherine Deneuve, Carole Bouquet, Vanessa Paradis, Nicole Kidman, Anna Mouglalis, Audrey Tautou, Keira Knightley, Kristen Stewart and Marilyn Monroe. The House of Chanel is known for the "little black dress", the perfume No. 5 de Chanel, and the Chanel Suit. Chanel's use of jersey fabric produced garments that were comfortable and affordable. Chanel revolutionized fashion — high fashion (haute couture) and everyday fashion (prêt-à-porter) — by replacing structured-silhouettes, based upon the corset and the bodice, with garments that were functional and at the same time flattering to the woman's figure. In the 1920s, the simple-line designs of Chanel couture made popular the "flat-chested" fashions that were the opposite of the hourglass-figure achieved by the fashions of the late 19th century — the Belle Époque of France (ca. 1890–1914), and the British Edwardian era (ca. 1901–1919). Chanel used colors traditionally associated with masculinity in Europe, such as grey and navy blue, to denote feminine boldness of character. The clothes of the House of Chanel featured quilted fabric and leather trimmings; the quilted construction reinforces the fabric, the design, and the finish, producing a garment that maintains its form and function while being worn. An example of such haute couture techniques is the woolen Chanel suit — a knee-length skirt and a cardigan-style jacket, trimmed and decorated with black embroidery and gold-coloured buttons. The complementary accessories were two-tone pump shoes and jewellery, usually a necklace of pearls, and a leather handbag. The House of Chanel (Chanel S.A.) originated in 1909 when Gabrielle Chanel opened a millinery shop at 160 Boulevard Malesherbes, the ground floor of the Parisian flat of the socialite and textile businessman Étienne Balsan, of whom she was the mistress. Because the Balsan flat also was a salon for the French hunting and sporting élite, Chanel had the opportunity to meet their demi-mondaine mistresses, who, as such, were women of fashion, upon whom the rich men displayed their wealth — as ornate clothes, jewelry, and hats. Coco Chanel thus could sell to them the hats she designed and made; she thus earned a living, independent of her financial sponsor, the socialite Balsan. In the course of those salons Coco Chanel befriended Arthur 'Boy' Capel, an English socialite and polo player friend of Étienne Balsan; per the upper class social custom, Chanel also became mistress to Boy Capel. 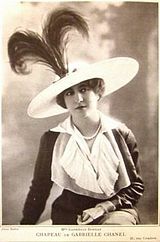 Despite that social circumstance, Boy Capel perceived the businesswoman innate to Coco Chanel, and, in 1910, financed her first independent millinery shop, Chanel Modes, at 21 rue Cambon, Paris. Because that locale already housed a dress shop, the business-lease limited Chanel to selling only millinery products, not couture. Two years later, in 1913, the Deauville and Biarritz couture shops of Coco Chanel offered for sale prêt-à-porter sports clothes for women, the practical designs of which allowed the wearer to play sport. In 1921, to complement the suit of clothes, Coco Chanel commissioned the perfumer Ernest Beaux to create a perfume for the House of Chanel. His perfumes included the perfume No.5, named after the number of the sample Chanel liked best. Originally, a bottle of No. 5 de Chanel was a gift to clients of Chanel. The popularity of the perfume prompted the House of Chanel to offer it for retail sale in 1922. The success of the No. 5 encouraged Coco Chanel to expand perfume sales beyond France and Europe and to develop other perfumes — for which she required investment capital, business acumen, and access to the North American market. To that end, the businessman Théophile Bader (founder of Galeries Lafayette) introduced the venture capitalist Pierre Wertheimer to Coco Chanel. Their business deal established the Parfums Chanel company, a parfumerie of which Wertheimer owned 70 per cent, Bader owned 20 per cent, and Chanel owned 10 per cent; commercial success of the joint enterprise was assured by the Chanel name, and by the cachet of la "Maison Chanel", which remained the sole business province of Coco Chanel. From the gamine fashions of the 1920s, Coco Chanel had progressed to womanly fashions in the 1930s: evening-dress designs were characterised by an elongated feminine style, and summer dresses featured contrasts such as silver eyelets, and shoulder straps decorated with rhinestones - drawing from Renaissance-time fashion stylings. In 1932, Chanel presented an exhibition of jewelry dedicated to the diamond as a fashion accessory; it featured the Comet and Fountain necklaces of diamonds, which were of such original design, that Chanel S.A. re-presented them in 1993. Moreover, by 1937, the House of Chanel had expanded the range of its clothes to more women and presented prêt-à-porter clothes designed and cut for the petite woman. Among fashion designers, only the clothes created by Elsa Schiaparelli could compete with the clothes of Chanel. During the Second World War (1939–45), Coco Chanel closed shop at Maison Chanel — leaving only jewellery and parfumerie for sale — and moved to the Hôtel Ritz Paris, where she lived with her boyfriend, Hans Günther von Dincklage, a Nazi intelligence officer. Upon conquering France in June 1940, the Nazis established a Parisian occupation-headquarters in the Hôtel Meurice, on the rue de la Rivoli, opposite the Louvre Museum, and just around the corner from the fashionable Maison Chanel S.A., at 31 rue Cambon. Meanwhile, because of the Nazi occupation's official anti-Semitism, Pierre Wertheimer and family, had fled France to the U.S., in mid-1940. Later, in 1941, Coco Chanel attempted to assume business control of Parfums Chanel but was thwarted by an administrative delegation that disallowed her sole disposition of the parfumerie. Having foreseen the Nazi occupation policy of the seizure-and-expropriation to Germany of Jewish business and assets in France, Pierre Wertheimer, the majority partner, had earlier, in May 1940, designated Felix Amiot, a Christian French industrialist, as the "Aryan" proxy whose legal control of the Parfums Chanel business proved politically acceptable to the Nazis, who then allowed the perfume company to continue as an operating business. Occupied France abounded with rumours that Coco Chanel was a Nazi collaborator; her clandestine identity was secret agent 7124 of the Abwehr, code-named "Westminster". As such, by order of General Walter Schellenberg, of the Sicherheitsdienst, Chanel was despatched to London on a mission to communicate to British Prime Minister Winston Churchill the particulars of a "separate peace" plan proposed by Reichsführer-SS Heinrich Himmler, who sought to avoid surrendering to the Red Army of the Soviet Russians. At War's end, upon the Allied liberation of France, Chanel was arrested for having collaborated with the Nazis. In September 1944, the Free French Purge Committee, the épuration, summoned Chanel for interrogation about her collaborationism, yet, without documentary evidence of or witnesses to her collaboration with the Nazis, and because of Churchill's secret intervention in her behalf, the épuration released Coco Chanel from arrest as a traitor to France. Despite having been freed by the political grace of Churchill, the strength of the rumours of Chanel's Nazi collaboration had made it not possible for her to remain in France; so Coco Chanel and her German lover, Hans Günther von Dincklage, went into an eight-year exile to Switzerland. In the post–war period, during Coco Chanel's Swiss exile from France, Pierre Wertheimer returned to Paris and regained formal administrative control of his family's business holdings — including control of Parfums Chanel, the parfumerie established with his venture capital, and successful because of the Chanel name. In Switzerland, the news revived Coco Chanel's resentment at having been exploited by her business partner, for only ten per cent of the money. So she established a rival Swiss parfumerie to create, produce, and sell her "Chanel perfumes". In turn, Wertheimer, the majority capital stock owner of Parfums Chanel, saw his business interests threatened, and his commercial rights infringed because he did not possess legally exclusive rights to the Chanel name. Nonetheless, Wertheimer avoided a trademark infringement lawsuit against Coco Chanel, lest it damage the commercial reputation and the artistic credibility of his Chanel-brand parfumerie. Wisely, Pierre Wertheimer settled his business- and commercial-rights quarrel with Chanel, and, in May 1947, they renegotiated the 1924 contract that had established Parfums Chanel — she was paid $400,000 in cash (wartime profits from the sales of perfume No. 5 de Chanel); assigned a 2.0 per cent running royalty from the sales of No. 5 parfumerie; assigned limited commercial rights to sell her "Chanel perfumes" in Switzerland; and granted a perpetual monthly stipend that paid all of her expenses. In exchange, Gabrielle Chanel closed her Swiss parfumerie enterprise, and sold to Parfums Chanel the full rights to the name "Coco Chanel". In 1953, upon returning to France from Switzerland, Coco Chanel found the fashion business enamoured of the "New Look" (1947), by Christian Dior; the signature shape featured a below-mid-calf-length, full-skirt, a narrow waist, and a large bust (stylistically absent since 1912). As a post–War fashion that used some 20 yards of fabric, the House of Dior couture renounced wartime rationing of fabric for clothes. In 1947 — after the six-year austerities of the Second World War (1939–45) — the New Look was welcomed by the fashion business of Western Europe because sales of the pretty clothes would revive business and the economy. To regain the business primacy of the House of Chanel, in the fashion fields of haute couture, prêt-à-porter, costume jewelry, and parfumerie, would be expensive; so Chanel approached Pierre Wertheimer for business advice and capital. Having decided to do business with Coco Chanel, Wertheimer's negotiations to fund the resurgence of the House of Chanel, granted him commercial rights to all Chanel-brand products. The House of Chanel also presented leather handbags with either gold-colour chains or metal-and-leather chains, which allowed carrying the handbag from the shoulder or in hand. The quilted-leather handbag was presented to the public in February 1955. In-house, the numeric version of the launching date "2.55" for that line of handbags became the internal "appellation" for that model of the quilted-leather handbag. Throughout the 1950s, the sense of style of Chanel continued undeterred; the firm's initial venture into masculine parfumerie, Pour Monsieur was a successful eau de toilette for men. Chanel and her spring collection received the Fashion Oscar at the 1957 Fashion Awards in Dallas. Pierre Wertheimer bought Bader's 20 per cent share of the Parfums Chanel, which increased the Wertheimer percentage to 90 per cent. Later, in 1965, Pierre's son, Jacques Wertheimer, assumed his father's management of the parfumerie. About the past business relationship, between Pierre Wertheimer and Coco Chanel, the Chanel attorney, Chambrun said that it had been "one based on a businessman's passion, despite her misplaced feelings of exploitation . . . [thus] when Pierre returned to Paris, full of pride and excitement [after one of his horses won the 1956 English Derby]. He rushed to Coco, expecting congratulations and praise. But she refused to kiss him. She resented him, you see, all her life." Coco Chanel died on 10 January 1971, at the age of 87. She was still designing at the time of her death. For example, in the (1966–1969) period, she designed the air hostess uniforms for Olympic Airways, the designer who followed her was Pierre Cardin. In that time, Olympic Airways was a luxury airline, owned by the transport magnate Aristotle Onassis. After her death, the leadership of the company was handed down to Yvonne Dudel, Jean Cazaubon and Philippe Guibourgé. After a period of time, Jacques Wertheimer bought the controlling interest of the House of Chanel. Critics stated that during his leadership, he never paid much attention to the company, as he was more interested in horse breeding. In 1974, the House of Chanel launched Cristalle eau de toilette, which was designed when Coco Chanel was alive. 1978 saw the launch of the first non-couture, prêt-à-porter line and worldwide distribution of accessories. Alain Wertheimer, son of Jacques Wertheimer, assumed control of Chanel S.A. in 1974. In the U.S., No. 5 de Chanel was not selling well. Alain revamped Chanel No.5 sales by reducing the number of outlets carrying the fragrance from 18,000 to 12,000. He removed the perfume from drugstore shelves and invested millions of dollars in advertisement for Chanel cosmetics. This ensured a greater sense of scarcity and exclusivity for No.5, and sales rocketed back up as demand for the fragrance increased. He used famous people to endorse the perfume — from Marilyn Monroe to Audrey Tautou. Looking for a designer who could bring the label to new heights, he persuaded Karl Lagerfeld to end his contract with fashion house Chloé. In later collections Lagerfeld chose to break away from the ladylike look of Chanel and began to experiment with fabrics and styles. During the 1980s, more than 40 Chanel boutiques opened worldwide. By the end of the 1980s, the boutiques sold goods ranging from US$200-per-ounce perfume, US$225 ballerina slippers to US$11,000 dresses and US$2,000 leather handbags. Chanel cosmetics and fragrances were distributed only by Chanel outlets. Chanel marketer Jean Hoehn explained the firm's approach, saying, "We introduce a new fragrance every 10 years, not every three minutes like many competitors. We don't confuse the consumer. With Chanel, people know what to expect. And they keep coming back to us, at all ages, as they enter and leave the market." The 1984 launch of a new fragrance, in honor of the founder, Coco, continued the label's success. In 1986, the House of Chanel struck a deal with watchmakers and in 1987, the first Chanel watch debuted. By the end of the decade, Alain moved the offices to New York City. In 1996, Chanel bought gun-makers Holland & Holland, but failed in its attempt to revamp the firm. The swimwear label Eres was also purchased in 1996. Chanel launched the perfumes Allure in 1996 and Allure Homme in 1998. The House of Chanel launched its first skin care line, Précision, in 1999. That same year, Chanel launched a travel collection, and under a license contract with Luxottica, introduced a line of sunglasses and eyeglass frames. While Wertheimer remained chairman, Françoise Montenay became CEO and President. 2000 saw the launch of the first unisex watch by Chanel, the J12. In 2001, watchmaker Bell & Ross was acquired. The same year, Chanel boutiques offering only selections of accessories were opened in the United States. Chanel launched a small selection of menswear as a part of their runway shows. In 2002, Chanel launched the Chance perfume and Paraffection, a subsidiary company originally established in 1997 to support artisanal manufacturing, that gathered together Ateliers d'Art or workshops including Desrues for ornamentation and buttons, Lemarié for feathers, Lesage for embroidery, Massaro for shoemaking and Michel for millinery. A prêt-à-porter collection was designed by Karl Lagerfeld. Chanel introduced Coco Mademoiselle and an "In-Between Wear" in 2003, targeting younger women, opened a second shop on Rue Cambon, opened a 2,400 square feet (220 m2) boutique in Hong Kong and paid nearly $50 million USD for a building in Ginza, Tokyo. In 2007, Maureen Chiquet was appointed CEO. She remained CEO until her termination in 2016. Nick Hochland succeeded Chiquet as CEO. In 2018, Chanel announced that it would be moving its global headquarters to London. In December 2018, Chanel announced that it would ban fur and exotic skins from its collections. The Chanel logotype comprises two interlocked, opposed letters-C, one faced left, one faced right. The logotype was given to Chanel by the Château de Crémat, Nice, and was not registered as a trademark until the first Chanel shops were established. Along with other makers, Chanel is a target of counterfeiters. An authentic classic Chanel handbag retails from around US$4,150, while a counterfeit usually costs around US$200. Beginning in the 1990s, all authentic Chanel handbags were numbered. Logo - the House of Chanel is represented by two interlocked letters "C" for "Coco Chanel".This was first introduced in the late 1980s or early 1990s. Perfume label trademark: the "No. 5 de Chanel" trademark and font were introduced in 1926. Couture trademark: the small caps name and font were introduced in 1924. One timeline measurement for Chanel presence in the United States is via trademarks registered with the United States Patent and Trademark Office (USPTO). On Tuesday, 18 November 1924, Chanel, Inc. filed trademark applications for the typeset mark Chanel and for the interlocking CC design plus word mark. At that time, the trademarks were registered only for the perfume, toiletry, and cosmetic products in the primary class of common metals and their alloys. Chanel provided the description of face powder, perfume, eau de cologne, toilet water, lip stick, and rouge, to the USPTO. The Chanel and double-C trademarks were awarded on the same date of 24 February 1925 with respective Serial Numbers of 71205468 and 71205469. The first trademark application for the No. 5 perfume was on Thursday, 1 April 1926, described as perfume and toilet water. First use and commercial use was stated as 1 January 1921. Registration was granted on 20 July 1926 with Serial Number 71229497. Chanel classic handbag in quilted-leather, with adjustable double-chains, to wear it on the arm or at the shoulder. Chanel handbag with quilted-leather, the Belgian Queen Fabiola, and her husband, King Baudouin, visited the Nixon White House, in 1969. Chance Eau Tendre — Jacque Polge developed Chance Eau Tendre to feature floral and fruity and notes, among them grapefruit, quince, hyacinth, jasmine, amber, cedar, iris, and white musk. Coco Mademoiselle — British actress Keira Knightley, spokeswoman for the Coco Mademoiselle fragrance, portrayed young Coco Chanel in a short film advert directed by Joe Wright. No. 5 — No. 5 The Film, is about Nicole Kidman, with whom an anonymous aspiring writer (Rodrigo Santoro) becomes enamoured; afterwards, a fragrant memory is all he retains of her. In 2008, the French model and actress Audrey Tautou became the face of Perfume No. 5. 2012 marked the first year that a man — actor Brad Pitt — represented a female fragrance. The bottle's stopper, cut like a diamond, is said to have been inspired by the geometry of the Place Vendôme in Paris. 28 La Pausa - Named for La Pausa, Chanel's villa on the French Riviera. Cosmetics are the most accessible Chanel product, with counters in department stores across the world, including Harrods, Galeries Lafayette, Bergdorf Goodman, Hudson's Bay, and David Jones, Wojooh, John Lewis, Debenhams, Boots as well as its own beauty boutiques. Chanel 'High Jewellery' was founded in November 1932. Chanel debuted 'Bijoux de Diamants' at her Faubourg Saint-Honoré, Paris mansion. In 2012, the company created a special collection to celebrate Diamants' 80th anniversary. Current collections include High Jewellery, Camelia, Comete, Baroque, 1932, Ultra, Bridal and Jewellery Watches. The Chanel wristwatch division was established in 1987. In 1995, division presented a second design, the Matelassé. Although the Première and Matelassé wristwatches were successful products, the presentation, in 2000, of the Chanel J12 line of unisex style wristwatches, made of ceramic materials, established Chanel wristwatches as a Chanel marque. The J12 line of wristwatches features models in four dial-face sizes: 33mm, 38mm, 41mm, and 42mm. In 2008, Chanel S.A. and Audemars Piguet developed the ceramic Chanel AP-3125 clockwork, exclusive to the House of Chanel. Chanel owns the wineries Château Rauzan-Ségla, Château Canon, and St. Supéry Estate Vineyards & Winery. At Paris Fashion Week, Chanel presented its Spring 2016 line on an airport themed runway. Worldwide, Chanel S.A. operates around 310 Chanel boutiques; 94 in Asia, 70 in Europe, 10 in the Middle East, 128 in North America, 1 in Central America, 2 in South America, and 6 in Oceania. The shops are located in wealthy communities, usually in department stores like Harrods and Selfridges, high streets, shopping districts, and inside airports. In 2015, the company paid a record $152 million for 400 North Rodeo Drive in Beverly Hills. This is the most expensive amount paid for retail space in Los Angeles. The Chanel joaillerie, Place Vendôme, Paris, France. ^ "Chanel reveals earnings for the first time in its 108-year historyList". CNN.com. ^ "ChanelInternationalBV - PrivCo - Private Company Financial Intelligence". www.privco.com. ^ a b c d e f g h i j k l m n o p q r s t u "Chanel". Fashion Model Directory. Archived from the original on 27 October 2010. Retrieved 19 June 2008. ^ Laube, Mindy (7 May 2008). "Chanel's new face: Audrey Tautou". The Age. Australia. Archived from the original on 10 May 2008. ^ "Gabrielle "Coco" Chanel (1883–1971) and the House of Chanel". Heilbrunn Timeline of Art History, The Metropolitan Museum of Art. New York. Archived from the original on 1 November 2016. ^ a b c d e Martin, Richard (1995). Contemporary fashion. London: St. James Press. p. 750. ISBN 1-55862-173-3. ^ Costume", pg. 52, Eyewitness Books. ^ a b c d e f g h i j k l m n o p q r s t u v w x y z aa ab ac "Chanel S.A". Funding Universe. Archived from the original on 11 June 2008. Retrieved 19 June 2008. ^ "BUSINESS ABROAD: King of Perfume". Time. 14 September 1953. Archived from the original on 10 July 2010. Retrieved 28 April 2010. ^ Mazzeo, Tilar J. The Secret of Chanel No. 5 HarperCollins 2010, p. 150. ^ McAuley, James (1 September 2011). "The Exchange: Coco Chanel and the Nazi Party". The New Yorker. Archived from the original on 26 October 2011. Retrieved 4 September 2011. ^ Mazzeo, Tilar J. The Secret of Chanel No. 5, pp. 176–77. ^ "The Royal Order of Sartorial Splendor: Flashback Friday: The Fabulous Princess Margaret". orderofsplendor.blogspot.com. 10 February 2012. Archived from the original on 2 March 2012. ^ Chevalier, Michel; Gerald Mazzalovo (2012). "3". Luxury Brand Management (second ed.). Singapore: John Wiley & Sons. p. 58 (of 316). ISBN 978-1-118-17176-9. ^ "This Chanel-owned swimwear label has all the vintage swimsuits you need". Lifestyle Asia. 6 April 2018. Retrieved 8 January 2019. ^ "Chanel". Voguepedia. Archived from the original on 30 October 2013. Retrieved 28 September 2012. ^ "Maureen Chiquet's Move From Chanel to Self-Empowerment". Retrieved 28 October 2018. ^ "Lagos Fashion Week Beckons High Fashion - Tush Magazine". Tush Magazine. 28 October 2018. Retrieved 28 October 2018. ^ "Chanel chooses London for global office". BBC News. 13 September 2018. Retrieved 28 October 2018. ^ "French Fashion House Chanel Bans Fur and Exotic Animal Skins". Time.com. ^ "Chanel Logo Design and History". Archived from the original on 24 May 2010. Retrieved 10 June 2010. ^ "Flash Back Friday: The Legend of the Chanel Logo's Double C". Archived from the original on 9 December 2012. Retrieved 14 January 2013. ^ "A message from Chanel". Chanel Inc. Archived from the original on 20 November 2008. Retrieved 8 May 2009. ^ "U.S. Trademark 71205468". Trademark Applications and Registrations Retrieval (TARR). United States Patent and Trademark Office. 18 November 1924. Archived from the original on 10 August 2013. Retrieved 29 October 2011. ^ "Sci-Fi Chanel". The Fashionide. 24 July 2013. Archived from the original on 4 September 2013. Retrieved 22 August 2014. ^ "Boyish Attitude". The Fashionide. 11 March 2014. Archived from the original on 18 March 2014. Retrieved 22 August 2014. ^ "Chanel Pre-Fall 2018 Fashion Show". vogue.com. Archived from the original on 18 February 2018. ^ CHANEL (28 December 2017). "The Paris-Hamburg 2017/18 Métiers d'art show - CHANEL". Archived from the original on 26 January 2018 – via YouTube. ^ "Chanel Spring 2018 Couture Fashion Show". vogue.com. Archived from the original on 24 February 2018. ^ "Chanel Resort 2019 Fashion Show". Vogue. Retrieved 19 February 2019. ^ "Chanel Cruise 2019 Bangkok". Vogue Thailand. Retrieved 19 February 2019. ^ Burr, Chandler (2008). The Perfect Scent: A Year Inside the Perfume Industry in Paris and New York. Henry Holt and Co. ISBN 0-8050-8037-6. ^ Telegraph.co.uk "Nicole Kidman's latest Hollywood blockbuster"
^ Elaine, Sciolino (7 June 2013). "Letter from Paris: The House that Coco Built". The New York Times. Archived from the original on 25 October 2014. ^ "Fine Jewellery & High Jewellery - CHANEL". www.chanel.com. Archived from the original on 10 January 2013. ^ "Exclusive World of Chanel Watches Watches Channel". watches.infoniac.com. Archived from the original on 11 February 2008. ^ Pleven, Liam. "Chanel Pays Record Price for Retail Space". Wall Street Journal. ISSN 0099-9660. Archived from the original on 9 December 2015. Retrieved 9 December 2015. Wikimedia Commons has media related to Chanel.